• The sensor swabs have extremely soft head. The head cover is made of super fine microfiber cloth which is soft to your sensor and hard to the dirt. • Each swab is packed in a vacuumed package ensure 100% dust free. • The powerful cleaning liquids are specially formulated for digital camera sensor cleaning. It dries quickly. 1. Before start, shoot a piece of white paper with Aperture Priority (A) mode set at f/22 or higher. You can see where the dust is located on the sensor. 2. You need to set your camera to a special clean mode, so the delicate shutter and mirror mechanisms stay out of the way when you clean the sensor. 3. Go to your camera setup, and select ‘Lock Mirror Up For Cleaning’. This option will be greyed out unless your camera’s battery is fully charged. For Cameras that do not have the lock mirror up function, you could set your camera exposure on Bulb. The Bulb setting will allow you to keep the mirror up until you release the shutter. 4. Remove the lens. Use the air blower to blast the dust from the sensor. Be careful, do not touch the sensor or other internal components with the blower tip. 5. Take out the UES Sensor Swab from the vacuum package. Drip 1-2 drops of UES Sensor Cleaning Liquids to the head of the swab. Don’t use too much liquid. 6. Drag the swab slowly and smoothly from the left of the sensor to the right. Use a single movement, and don’t rub or scratch at the sensor. 7. Turn the swab 180 degrees and drag the clean side from right to left. Throw this swab away. Never reuse used swabs. 8. Turn the camera off to reset the mirror. 9. Install the lens and shoot a piece of white paper with Aperture Priority (A) mode set at f/22 or higher. You will find out if the dust or dirt is cleaned. 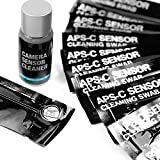 If dust remains, repeat the steps A to G.
This entry was posted in Discount Photography and tagged 15ml, 16mm, APSC, Camera, Cleaner, Cleaning, DSLR, Liquid, Sensor, Solution, Swab, Swabs by Ball Photo. Bookmark the permalink.